ISLAMABAD: Prime Minister Imran Khan on Monday said that his government will raise the issue of blasphemous caricatures in the United Nations General Assembly (UNGA) while putting the blame of such incidents on lack of unity among the Muslim countries. 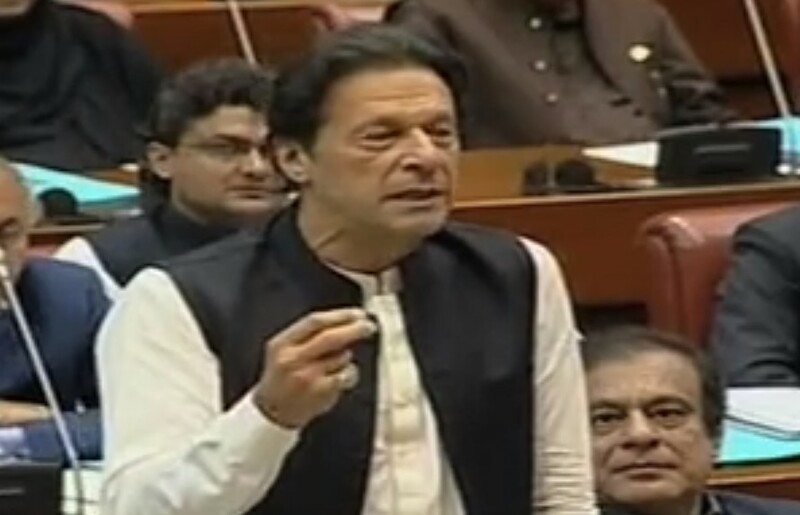 In his maiden address to the Senate, PM Imran called it a “collective failure” of Muslim countries for the absence of an international policy against blasphemous content. The prime minister said that though the government will raise the issue with the UN, he didn’t think it would be of much use, adding that his government will raise the matter in the Organisation of Islamic Cooperation (OIC) and formulate a collective policy which could then be presented at international forums. Imran lamented that this should have been done years ago while giving the example of the Holocaust and how four European countries have jail sentences for anyone who misquotes the figures of Holocaust. “That is because they realise that this is something that hurts the sentiments of the Jewish community,” he explained. The premier emphasised on the need to have a similar policy for this matter so that people do not repeatedly hurt the sentiments of Muslims. PM Khan also said that he and his ministers would continue to raise the importance of the Senate and the National Assembly by making sure that government representation is present in all sessions. “I have told the speaker to devise the rules for this and this practice will begin soon,” the prime minister said. Speaking about his government’s efforts to minimise overall spending, Imran expressed his desire for the senators to be a part of his austerity drive to minimise all government expenses. “This will only bring in minimal saving, but it will send out the message to taxpayers that we care about where their money is spent,” he added. PM Khan said that Pakistan is amongst the top five most charitable countries but it is also among countries that pay the least amount of tax. “It is because people have not trusted past governments,” he said, adding that the austerity drive is an effort to change that. “The ruling elite should show by example that peoples’ tax money is being spent on them,” the prime minister said. The government is also looking to increase revenue, besides cost cutting, including reforming the Federal Board of Revenue (FBR), he said, adding that other such measures will be discussed in the parliament soon. Earlier, the Senate passed a resolution to bring the UN’s attention to the matter regarding the announcement by the leader of Dutch Freedom Party and parliamentarian Geert Wilders to hold a competition of blasphemous caricatures. “This House strongly condemns the venomous, vicious and contemptuous decision of Geert Wilders, the notorious Islamophobe, belonging to the Dutch Party of Freedom, to hold a ‘Draw Muhammad Cartoon Competition’ to be held later this year in Netherlands,” read the resolution. “The Senate of Pakistan reaffirms that the love for our beloved Prophet (SAW) is beyond any doubt a part of our faith and no Muslim can tolerate any such vicious, contemptuous and calculated insult of our beloved Prophet (SAW),” the resolution added. The Senate also agreed to lodge a formal protest with the Dutch government through its embassy in the country. A special session of the Organisation of Islamic Cooperation (OIC) may also be convened to formally engage the European Union, the UN and individual states to chalk out limits of freedom of expression to maintain global peace, the Upper House decided. Lawmakers also urged the Ministry of Religious Affairs and Inter-Faith Harmony to constitute a committee of Muslim intellectuals and experts to deliberate on the issue and frame workable proposals for preventing such blasphemous movies, cartoons, books and other such content.